ACK IN JULY 2013, Pope Francis made news because he invited a group of homeless men & women to come for dinner at the Vatican. It wasn’t widely reported, but his predecessor, Pope Benedict XVI, had actually done something similar. 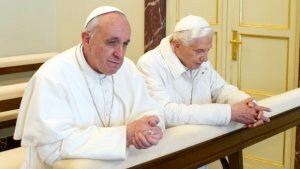 Pope Benedict had invited a group of homeless people to lunch back in 2010. There were some differences between the two events, though. For one of the meals, the Holy Father actually attended the event personally and went to each table to greet the homeless people. At one of the events, 200 people were invited, while at the other there were 250. So, which of those events was which? Which Holy Father actually attended the event and ate with the larger number of homeless people? My point is not to criticize Pope Francis. I love Pope Francis, just as I have loved every pope before him. But, if a person were simply to go on the impression given in the secular media, that person would certainly have thought that it was Francis who had attended the meal with the larger number of homeless. The media is enthralled with Francis, and I think that’s great. They like him because he talks about the poor and the people on the fringes of society. Of course, every other pope before him has spoken about the poor and downtrodden, too (very often, in fact), but the media can sometimes suffer from selective hearing. The almost pre-determined script goes that Pope Benedict was a staunch, conservative academic who was behind the times, and that Francis is the new, friendly, liberal face of a changing Catholic Church. But, is that characterization really based on facts, or is it just part of an engaging media story? There is no doubt that stories with tension and struggle and conflict make for better news. But the “better story” is not necessarily the more accurate story. There is a wedge that some people try to drive between Pope Benedict and Pope Francis. That same false polarization has been the theme of much of the coverage surrounding this weekend’s historic canonization of Pope John XXIII and Pope John Paul II. I read a story on The Huffington Post the other day that was representative of most of the stories I have from the major news outlets (i.e., outside EWTN). It presents John XXIII as a “liberal champion” and John Paul II as a “conservative stalwart.” It goes on to describe John XXIII as the pope who threw open the windows to let in fresh air, while John Paul II is supposedly the pope who closed them up a bit to squelch the draft. In other words, the canonization has been reduced by many people to a matter of petty politics. But is that the most accurate story? Are either of those broad descriptions even accurate in themselves? Yes, these two popes were incredibly different in some respects, yet still very much alike in others. Before all else, they are alike in one very important way. Their most important point of unity is this: what made them saintly is the same thing that makes all saints saintly—the mercy of God. None of us, on our own power or by our own talents & abilities, is capable of sanctity. With God’s grace, however, all of us are capable of sanctity. To be a canonized saint means simply that the Church has formally recognized that a certain person is in heaven. There is a whole process for how that happens. It involves a close investigation of the person’s life & writings and the acceptance of two miracles attributed to the person’s intercession. But none of that is what really makes a person a saint. It might lead to the canonization ceremony, but it has no effect on the person’s salvation. In every age and in every place, the only means to eternal salvation is the mercy of God. None of us will reach heaven on account of how wonderful we are or all the good things we’ve done. We are never saved because we, ourselves, are good; we can be saved only because God, our Savior, is good. And He is very good! In the Roman Canon, right after the priest recites the second list of saints, he prays a brief summary of this idea. The prayer says this: “Admit us, we beseech You, into their company, not weighing our merits, but granting us Your pardon.” We may never be canonized, but because of God’s mercy, each of us has the same chance to become a saint as any pope. Every year since the year 2000, on this Second Sunday of Easter, the Church has celebrated Divine Mercy Sunday. Why? Because it was in that year that St. John Paul the Great (back when he was just Pope John Paul II) established that the octave day of the Easter solemnity should be observed as the Feast of Divine Mercy. We rejoice today, as two beloved popes are raised to the altars. Before all else, the cause of our celebration is not any of their many accomplishments, not any sort of politics, nor even the memorable, common touch of these two larger-than-life men. The cause of our celebration is the mercy of God, which was so visibly at work within them, enabling them to reach sanctity on Earth. Does the Church make saints? No. Does the media make saints? No. Does the pope make saints? No. The mercy of God alone makes saints. 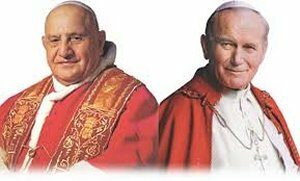 Praise God for St. John XXIII and St. John Paul II, by whose heavenly intercession we will all be richly blessed!